I know the holidays may be a bittersweet time for many people, especially when facing the anxiety, grief, fear, and anger that comes with breast cancer. My heart aches each time I talk to a woman newly diagnosed with breast cancer or adjusting treatments as her disease progresses; friends and family who have lost a loved one to breast cancer; and women who are still recovering from the financial, emotional and physical toll of a past diagnosis. As this year comes to a close and a new year is around the corner, I have a deep appreciation for the unique and important resources that Breast Cancer Action provides for women who are newly diagnosed and living with breast cancer. All of us who’ve faced a serious health crisis know how important accurate, evidence-based, patient-centered information is in navigating complex healthcare choices. All of us who have personally experienced or supported a loved one through a breast cancer diagnosis know that in the face of difficult decisions and hard questions, knowing where to turn and whom to turn to can make all the difference. Breast Cancer Action provides crucial information and resources about breast cancer to patients, caregivers, and people like you and me. We provide independent evaluation of treatment data from a patient perspective and work to ensure that every woman has access to balanced information that includes both harms and benefits of breast cancer procedures and treatments. I feel proud to lead an organization that will always put patients before profits. 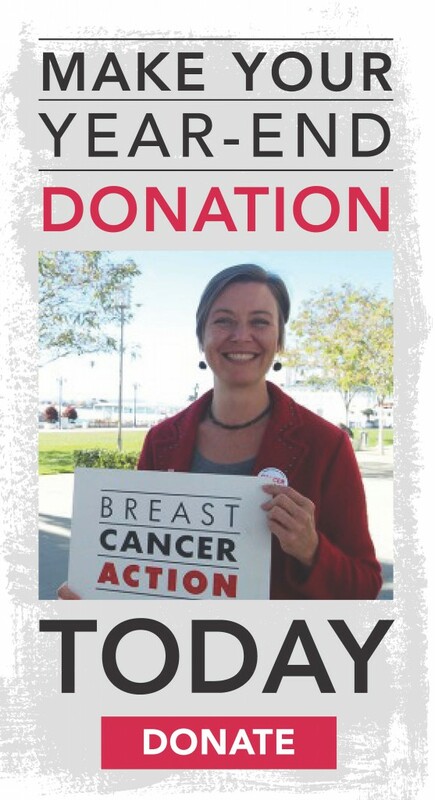 Breast Cancer Action will never take corporate funding from any company that profits from or contributes to breast cancer – so you can trust the information and resources we provide will never be influenced by corporate funders. Please make your year-end gift today so we can continue providing independent, evidence-based information at no charge to anyone who needs it.